We are leading manufacturer and exporter of Continuous Namkeen Fryer Machine and our product is made up of good quality. Deploying sophisticated technology and premium quality of steel we manufacture Continuous Namkeen Fryer Machines. Our Namkeen Fryer Machines are extensively used in the Snacks Making Market. Easy to operate, our machines are corrosion resistant and long lasting. Pellet Snacks Solutions are widely used for producing Namkeen, Bhujia, Ganthiya, Dals, Pellets, Fryums, Nylon Sev and Kurkure type of extruded snacks. 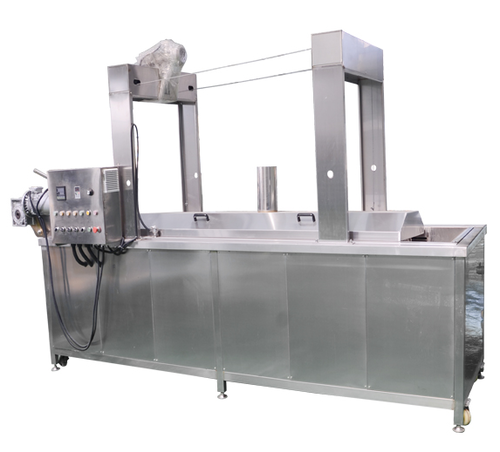 The working of the fryer is based on an edible oil circulation system. The edible oil is heated by means of appropriate heat exchanger. To smoothen your process, we also offer variety of heat exchangers based on diesel or thermic fluid. Dynamech Engineers’ Pellet Snacks Solutions are multipurpose and offered at economical prices. Established in 1985, a company where verbal assurance is still considered and respected as an unwavering commitment, 'Dynamech Engineers' excels with a belief in Traditional yet authentic trade practices. At Dynamech Engineers, we are dedicated to the production of high quality products allowing us to offer our clients the best available price/quality ratio and professional services available. Our style is build upon a set of core values that have risen from our employees. Taken together, these values define an organization that believes in improving service by building lasting relationships with customers. Our Quality Control engineers are the mainstay of our continued growth in our markets. Perpetual investment in Technological up gradation, product innovation and quality control has helped us meet the ever-expanding needs of the customers and exacting industry standards.